I am a sophomore majoring in Biology and minoring in Visual Arts. I am interested in this course for both its artistic and scientific approaches to recreating ancient Greek ceramics. I hope my stints with drawing, painting and photography in previous Visual Arts courses would be helpful for my encounter with clay here. I am looking forward to unearthing some ceramic mysteries this semester! View from the entrance into the firebox. Finally, we reached the day of reckoning – it was time to fire the kiln. When we arrived at Clayworks at 5:30 p.m., master potter Matthew Hyleck and Professor Balachandran had already been heating the kiln for 7 hours, climbing from 52 degrees to over 1100 degrees. Fahrenheit. This had been achieved by slowly fueling the flame in the kiln’s firebox with small sticks of pallet wood every few minutes, and watching the temperature rise on the pyrometer sensor held into the upper chamber of the kiln. The kiln had thus far been working in a steady oxygen rich environment, and we assumed that our pots were all turning red inside the firing chamber. After a brief outline of the night’s mission by Matt, we took turns add fuel to the kiln, and recording the changes in kiln temperature and any other observations such as changes in the color of the flame shooting out of the kiln chimney, or the more acrid smell of a reduction fire. Two planks of pre-cut pallet wood were fed into the stoking chamber at a time, initially only letting their ends burn at the tip of the combustion chamber. As the heat from the combustion chamber consumed the wood, the planks were pushed inward a short distance at a time. This process prevents a drastic drop in temperature whenever new fuel is introduced into the kiln. 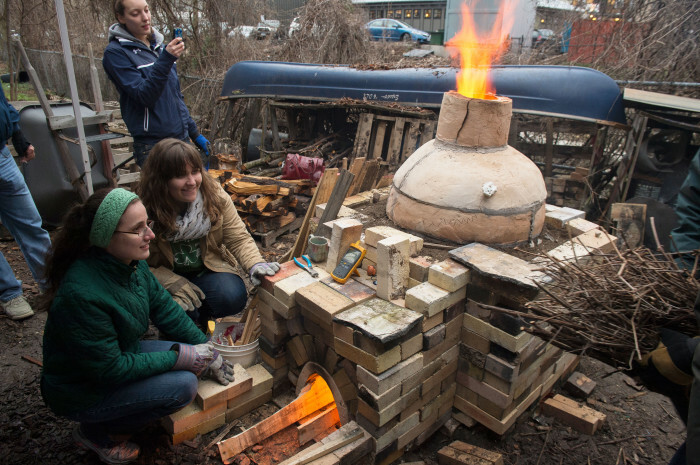 While the temperature rose, we heard from potter John Wissinger and Dr. Lisa Kahn, Associate Dean at George Mason University, of their experiences building and firing a kiln (on which our own was based). They had brought examples of their own pots, some of which had turned perfectly red and black, and others which exhibited firing flaws that we hoped we would be able to avoid. Anna Soifer and Elizabeth Winkelhoff add fuel to the fire. Our aim was to reach 1452 degrees F, or about 940 degrees Celsius, which is the point at which our red pots would black and the slipped areas would vitrify in an oxygen-poor environment. However, by 7:16 p.m., the kiln already blazed at 952 degrees C, and there was little time to close down the kiln’s access to oxygen before we risked our pots turning gun-metal gray due to overheating. We quickly closed off the vent-holes at the two sides of the combustion chamber, added three bundles of partially wet twigs to the firebox and sealed off the chimney. A thick smoke permeated through the walls of the kiln, engulfing us temporarily, and we were in the reductive firing phase. The temperature inside the kiln quickly plummeted to 749 degrees C as it was starved of oxygen to burn. We spent the next thirty minutes watching the clock, fueling up with pizza and doing two dramatic readings of the ancient poem “Kiln”, which warns of evil spirits destroying pots inside the kiln. After the thirty minutes, we reopened the vents and firebox, preparing for a second oxidation phase, raising the kiln temperature to approximately 830 degrees F again so that the non-slipped areas of our pots could return to red with the aid of oxygen finding its way back into the ceramic fabric. When we reached this stage, we closed off the vent-holes and firebox, but left the chimney open for airflow. At 8:00 p.m., the kiln was left to cool and we were left to wait on the results. One of our guests at the firing, Dr. Eleni Hasaki (an expert on ancient Greek kilns from the University of Arizona), mentioned that a kiln firing in ancient times was as much a social event to gather the local community as it was a manufacturing process. Indeed, a great number of people – from experts in the field to journalists to residents of the Mt. Washington neighborhood – showed up for this much-anticipated kiln firing. 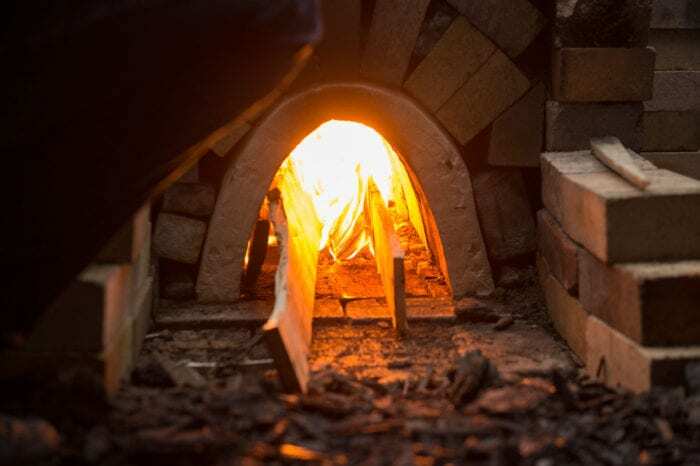 Unlike what probably took place at those ancient gatherings, we could only huddle around the kiln and stare intently at the electronic pyrometer, which jumped every few seconds, while devouring pizza and kiln-glazed marshmallows to keep our bellies full. Kiln firings have become a rarity in our modern lives in much the same way ancient Greek pottery is now confined to museums and archives. Perhaps our attempt here at recreating ancient Greek kylikes is but a form of remembering the ancient cultures and their history. Great post Arthur! I’m glad you drew attention to the social aspect of a kiln firing. Through the whole process, the work of a potter seems to have been relatively secluded, but if the firing was a social event it would tie the potters to the community, perhaps even provide a forum for artistic suggestions. Fantastic post! It was nice to read and relive some of the action. It was amazing to look upon the firing kiln (during an oxidation phase) and watch the flames spurt out the top like the in the pictures that Dr. Hasaki had brought for us. And after all the planning, to see a flame at all was just exhilarating. However, executing the plan is much different from the planning process itself. Actually stuffing the kiln with tinder and trying to close it up was a trying and smoky experience, which leads me to believe that there must have been a specific way to do it to minimize mistakes. As a first-time kiln firer, I had no idea what to expect. Luckily, Matt and Cami were there for us, and they finished closing the kiln for the reduction. But we were also lucky in that we had a constant measurement of kiln temperature, whereas an actual Greek potter would’ve had to have relied on his senses to tell what was going on. Matt, like you said, explained that the fire could smell differently based on the type of flame, and that the smoke color could vary depending on what phase it was in. Things like that seem to be so fickle and if we had to use only indicators like that I have no idea how we’d get anything done right. Being joined by Dr. Eleni Hasaki, John Wissinger, and Dr. Lisa Kahn was more than surreal! Their appearance and support at our firing significantly increased the gravity and importance of our own research. They were genuinely interested in our findings and techniques, even comparing our practices to their own. It felt like we had finally joined them as specialists in this field of study. We aren’t just replicating the approach that other scholars have taken; we are forging our own path. As Arthur mentioned, early on in the firing process, we were told that our goal was to reach 940 degrees C so that the slip would vitrify, but not to go above 950 degrees C or risk turning the vessels a gun-metal gray. This is an extremely narrow range to have such significance, especially as the temperature is not easy to control. On our last stoke, the kiln temperature rose from in the 930s degrees C to 952 degrees C in minutes, and there was little we could do to stop it but frantically put the kiln into reduction. If managing the temperature was this difficult with a digital pyrometer, I can only imagine the years of observation and practice it must have taken to fire a kiln using only test pieces to determine temperature. Out of all the experiences we as apprentices have had thus far, it seems like firing the kiln may involve the steepest learning curve. I was so surprised at how little time it took to reach our target temperature. I was expecting to be there until 1 am per Professor Balachandran’s estimate. With Wissinger and Kahn present, they commented that we should only raise the temperature to a maximum of 940 degrees celsius, but we missed that! This is a testament to how fickle the firing process is, how delicate the nature of our slip, and how conscientious potters must’ve had to been in order to produce consistently quality products. I will be very interested to analyze the data from the firing- looking at the fluctuations in temperature minute to minute as well as the amount of fuel consumed in the process. The biggest surprise of the night was how quickly the process moved along. We thought we’d be leaving at 1 AM, but we actually left at 9 PM! I wonder why our temperature changed so quickly. What did we do differently from our sources? Like many of my classmates, I found it crazy imagining this firing without the aid of a pyrometer. And there clearly was plenty of room for variation – our run was predicted to last even past midnight but stopped short of 9, as Lauren said. But the potters of yesteryear has the assistance of generations before them to teach them the meaning behind each signal. Our equivalent to that could arguably have been technology, so the pyrometer is an excusable aid. I really enjoyed stoking the flame. That dip in temperature as a brief reduction environment was created was fascinating to me. The firing was truly an incredible experience. Obviously, one of the biggest surprises that we encountered was the dramatic difference between the expected time schedule and the actual one. While it was great to be able to go home so early, I can’t help but wonder how great of an impact the accelerated schedule had on the tiles and pots. I’d find it very difficult to believe that there wouldn’t be any notable consequences of such a dramatic time decrease. What differences might have come from a significantly slower firing process? I suppose there would really be only one way to find out. There would have to be another firing that is done much slower and then the resulting pieces could be compared with those from this firing. On thing that was mentioned several times the night of the firing was the possible association of pottery production with baking–specifically bread making. It is suggested that dough could have been laid flat on the kiln’s dome and baked to a crisp from the heat of the fire. It is very interesting to think about the relationship between these two crafts and craftspersons that may have worked in close proximity to each other, especially since would not normally associate them today. One of my favorite parts of the firing was seeing the chimney of our kiln belching two-foot flames out the top! This something the class has seen in depictions of firings painting on ancient ceramics so seeing it occur in person was exciting not only because it was quite beautiful and lively but also because it indicated we were really replicating some aspects of an ancient kiln. Like many of my classmates, I was surprised by the pungent smell emitted from the kiln. There was a distinct difference between the odor of the reduction fire and oxidation fire. The oxidation fire smelled like a campfire, while the reduction smoke was a more acrid, cloying smell that stuck to your clothes and hair. Each time we added logs to the fire, it produced a mini-reduction, which was signalled by the smell. Though the ancients had it tougher than us, I could see how they honed their skills throughout years of experience. It was such an enriching experience to be with the entire team of “Recreating Ancient Greek Ceramics” and with fellow kiln builders Kahn and Wissinger. Some structural details of the kiln floor (on how to ensure best air circulation) and the change of color of the chimney according to the different atmospheres were definitely an eye opener. Matt Hyleck’s comments on how all senses are involved in a firing from smell, to vision, touching, and voice in the reciting of the “Kiln Poem”) still resonate with me. The embers, the flames, the constant stoking made the scenes of the Penteskouphia pinakes from Ancient Corinth come alive! Moreover, the shared observation that the most challenging pieces on a kylix construction are the handles will make me appreciate this vase part even more. My sincere thanks to Sanchita Balachandran, Matt Hyleck, Baltimore Clayworks, and to all of you for your hospitality and for your deep engagement with the wonderful world of ancient Greek ceramics! Thanks for the post Arthur! It was a rather cold spring evening, and it had rained earlier that day. I was initially concerned that the dampness would affect the firing, but since the wood had mostly been protected from the wetness, most of the water was only in the air and the soil. The heat from the kiln was much welcomed, and standing nearby I constantly warmed my hands and body against the stone. It was magical to imagine that in ancient times, potters and apprentices would do the very same during the colder firing nights.